In this biographical letter, middle school student Chas Horton reflects on a teacher friend who helped him improve his academic performance. Throughout life, people are always influenced by others. This influence is what causes individuals to grow mentally. It has been no different for me. I have met many people and have learned something from each of them. The one person that sticks out in my mind as having had the most influence on me, however, is you. Last year, when I first entered your class, my parents had recently got a divorce, and I was coming out of a rough sixth-grade year. I needed something to fill the emptiness I was feeling. You were there for me. You had a way of making me feel good about myself. The talks that you had with us really touched on some things that I needed to hear. I remember one day you told us that the most important thing is that we like who we are. You restored some confidence in me that I thought I had lost. You worked with all of us to make us better students. You would make sure that everyone answered a question or added something to class each day. You would go around the room and ask each student a question or how he or she felt about something. You showed that you really did care if we learned. You would always stress doing more than just an average job, that we would not get very far if we were not willing to put forth that extra effort. You told us that if we did not like the way our lives were going that we should change them. I did not like the way mine was going, so I changed it. I was a lazy, chubby kid, happy to spend my free time just staying inside and watching TV. The summer after I had you, I became more active. I stayed outside a lot more and went to my friends’ houses more often. I began riding my bike often, and I slimmed down and gained muscle (you probably would have made a great exercise instructor). At the end of the year, we were all anxious to see what our grades were. You gave us these index cards that had our grades on them. I looked at mine, and then I turned the card over and read the words, “Don’t Just Get By!” You told us to bring the cards back senior year when we graduate and you would give us a dollar. Ever since our seventh-grade year, I have looked at that time as a turning point in my life. I credit most of those changes to you and your advice. Without your constant encouragement, I am sure that I would still be just getting by. Years from now, I will still look back on my childhood and reflect on the lessons that you were generous enough to share with me. I’m looking forward to moving on to high school, but I am especially anxious to meet with you and cash in on that card when I graduate. I will then get the chance to thank you in person for giving me the desire to do the best I can. 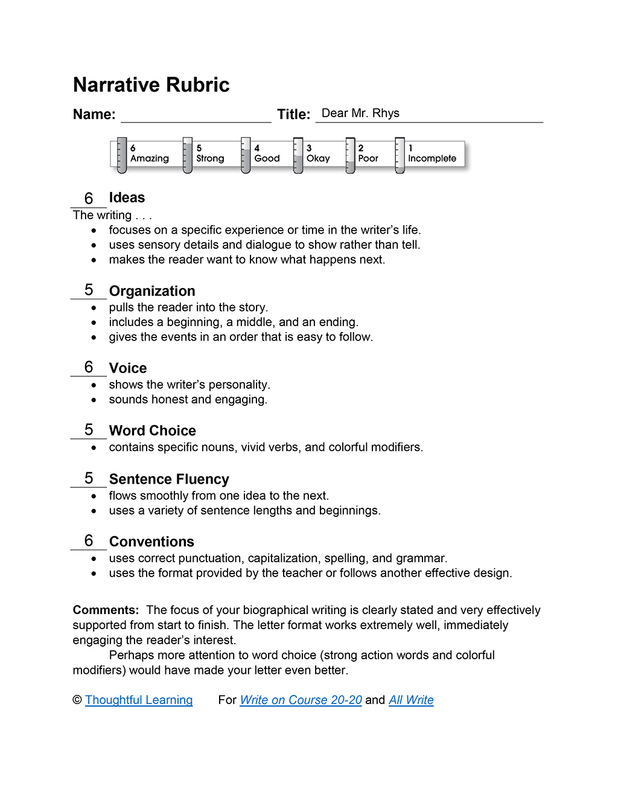 Dear Mr. Rhys by Thoughtful Learning is licensed under a Creative Commons Attribution-NonCommercial-ShareAlike 4.0 International License. Based on a work at k12.thoughtfullearning.com/assessmentmodels/dear-mr-rhys.